On continuously increase Smartphone users across India having Internet connectivity through Wi-Fi connection addiction rate also hiked in the same manner. For those mobile/tablet users enabled Wi-Fi connectivity have good news to pass their time when they are waiting for a train at Indian Railway Station. 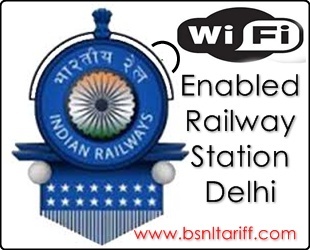 Prestigious Indian Railways has announced to start Wi-Fi connectivity across the country.Now Indian Railways on gesture basis has enabled Wi-Fi Connectivity at busiest Railway station Delhi Railways which handles 300 trains and 5 lakhs passengers daily, 16 platforms. Recently Indian Railways Launched Free Wi-Fi in Trains to New Delhi Howrah Rajdhani Express and extending its services very soon. Now Delhi Railway Stations will be the First Wi-Fi enabled railway station across India for access of internet connectivity through devices.